I disagree. Skip the unwieldy yellow metallic ruler. Buy a laser distance meter instead. That’s a mouthful isn’t it? Couldn’t marketing have come up with a catchier term? Well, that’s what the Leica DISTO calls itself. 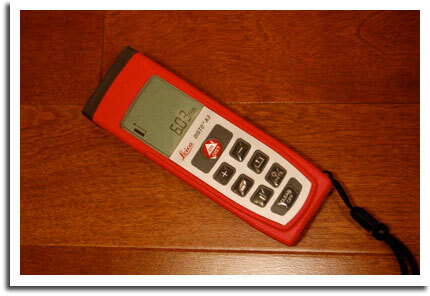 If you’re using a ruler to measure your condo, townhouse, co-op or house, buy a Leica DISTO. I know they’re expensive. I bought the Leica DISTO A3 on the Internet sight unseen. Would it be intuitive to use? Heck yeah. Would it be worth it? Heck yeah. Sure, it has some different modes that you can switch between, but the main buttons I use are “on/measure” and “off.” And, I can take four measurements at a time before I jot down the numbers into my notebook. No more measure, write, measure, write, etc. I can measure a large room in seconds. Try that with a traditional ruler. I know what’s that like. You hold one end and ask a friend to pull out the ruler in a straight line at the other end. Press the “on/measure” button. The Leica DISTO A3 takes the first measurement. Press the “on/measure” button. The Leica DISTO A3 takes the second measurement and calculates the square foot based on the two measurements. Press four buttons and you know the area of a room.